I have one major regret from my wedding day, and that is that I only ate one bite of my wedding cake. That one bite was phenomenal, but then I got whisked away for toasts and the father/daughter dance and visiting with out-of-town family, and then, well you know how it goes. The cake was from Miel Bon Bons Bakery, and it was amaretto with lavender frosting. 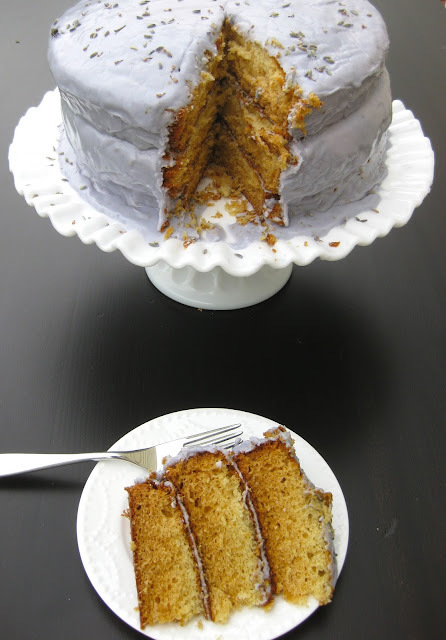 I've always loved lavender as a scent but had never really considered it as a dessert flavoring until our cake tasting. It was exquisite and unusual, and we knew after our first bite that this would be our wedding cake flavor. The cake itself is light and fluffy thanks to the whipped egg whites that you fold into the batter before baking. I wanted the icing to be light too, so instead of a typical buttercream with lots of, well, butter, I opted for a simpler glaze--icing with just powdered sugar and whole milk. This type of icing is more difficult to decorate with and will harden slightly after application, but I found it's lightness more suited to my summer-time cake craving--if you can call 5 cups of powdered sugar "light." Adam and I have been reminiscing over many a memory from that weekend one year ago, but instead of going on about all the blissful moments of the day here with you, (of which there were, admittedly, many) I thought it would be funnier to give you a list of all the NOT PERFECT things that happened. Just so I have it all down on record. 1.) About three hours before the rehearsal dinner, my mom broke out in red hives, later determined to be a reaction to the fish tacos she ate at the bridesmaid's luncheon. 2.) The wedding earrings I ordered two weeks before the wedding did not come in time. My bridesmaids and I went rushed to Nordstrom before the rehearsal dinner and bought new ones. 3.) On our way to the rehearsal dinner from the church, Adam's brother realized he had left the slideshow DVD at the hotel. We drove back to get it and were then 30 minutes late for the rehearsal dinner. 4.) After the wedding ceremony, Adam and I hopped into the nice black luxury car we had rented to drive us to the reception. The driver was from Dunn (bad decision on our part) and did not know where he was going. Adam had to break out the GPS on his phone to get us there. 5.) There were two sets of direction cards at the church--one set with directions from the church to the rehearsal dinner restaurant in Raleigh and one set with directions from the church to the reception site in Durham. After the wedding, my mom proceeded to hand out direction cards to people as they were leaving. Guess which ones she handed out? Yep. One of my friends drove to Raleigh after the wedding. 5.) Even though we dropped off the wine at the caterer's in clearly labeled boxes, they forgot it. They went back and picked it up, and it was no big deal, but I was a teensy bit stressed to hear about it while taking photos. 6.) It rained. Twice. Once about the time when guests were driving to the wedding and once between the wedding and reception. Oh, and it was already hot, but the rain made it HUMID HUMID HUMID. We both nearly passed out after taking photos outside for 2 hours and had to be revived a little before our first dance. 7.) Someone forgot to get the corn hole boards out of Adam's truck for the cocktail hour. However, we did pull them out later in the night and our guests enjoyed them. 8.) Our DJ played the Electric Slide and the Macarena. At first I cringed and thought "Oh God, cheesy!" BUT it got everyone out on the dance floor laughing, so it was ok.
And those are just the problems I am aware of. There were probably more. From that list it sounds like my wedding was a hot mess, but it wasn't. All the little kinks worked themselves out, and everything turned out ok. I think with Pinterest and all the wedding blogs around these days we've created this notion of the "perfect" wedding with ethereal flowers and endless amounts of personalized details. All those things are wonderful, and it is fun to plan a creative wedding that reflects you as a couple, but at the end of your wedding night, you're probably not going to remember exactly how the cake table looked, or if someone's place card was missing. I know I didn't. My favorite memory was standing at the altar, looking into the eyes of my new husband and singing "Come Thou Fount of Every Blessing." The emotion of the day had finally hit me, and I was crying big ugly tears, but I was surrounded by all the people I loved in the world, feeling so blessed, so complete and so happy. It was a perfectly unplanned moment, which is exactly how the best moments are. Separate the egg whites and egg yolks into two large mixing bowls. Using an electric mixer, beat the egg whites until soft peaks form. Add 1/2 cup of the sugar and continue beating until stiff peaks form. set aside. In the bowl with the egg yolks, add the butter, sugar, salt, baking powder, and extracts. Beat with mixer until completely smooth. Combine buttermilk, amaretto, and baking soda. Continue blending the egg mixture with the electric beaters, alternately adding the flour and the buttermilk/amaretto mixture, beginning and ending with the flour. Once fully blended, gently fold in the egg white mixture. Pour batter into 3 greased and floured 9-inch cake pans. Bake at 325 for 30 minutes or until toothpick inserted comes out clean. Cook in pans for 10 minutes, then remove and cool completely on wire racks. Using an electric mixer, blend powdered sugar, milk, and extracts until desired consistency. To thicken, add more powdered sugar. To thin, add more milk. Add food coloring and mix well. Frost cake immediately or icing will harden. 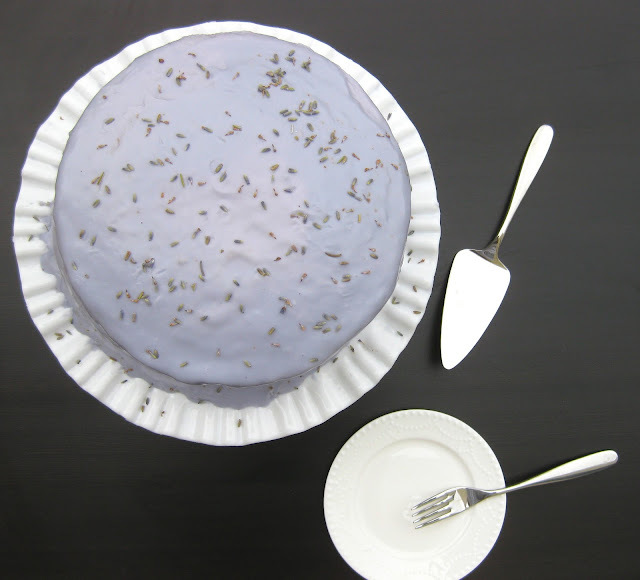 Sprinkle top layer with lavender petals. Amaretto Cake adapted from Cookie Madness. Lavender Icing adapted from Martha Stewart. Wedding photos from Lime Green Photography. I will be totally fine if the ONLY thing I eat at my wedding is a slice of cake...but damnit, I'll be eating a slice! This cake you've made definitely makes up for it though...amaretto flavoring sounds AMAZING!